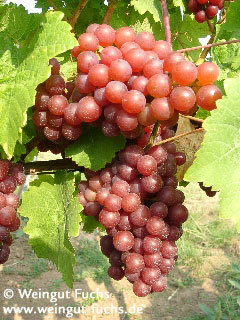 The Sieger is a white grape variety which was bred in 1929. It is very sensitive and requires warm locations. The vines sprout very early. The berries have a beautiful rosé colour and an intense and spicy bouquet. They ripen early and therefore are highly exposed to feeding damage by wasps. The Grape Variety provides wonderful spicy and dense dessert wines. Fuchs Sieger wines are very full-bodied. They provide an intense “grapy” taste combined with fine muscat flavours.